Nigeria is currently the largest oil producer in Africa and was the world's fourth-largest exporter of LNG in 2015. Nigeria's oil production is hampered by instability and supply disruptions, while its natural gas sector is restricted by the lack of infrastructure to commercialize natural gas that is currently flared (burned off). Nigeria is the largest oil producer in Africa, holds the largest natural gas reserves on the continent, and was the world's fourth-largest exporter of liquefied natural gas (LNG) in 2015.1 Nigeria became a member of the Organization of the Petroleum Exporting Countries (OPEC) in 1971, more than a decade after oil production began in the oil-rich Bayelsa State in the 1950s.2 Although Nigeria is the leading oil producer in Africa, production is affected by sporadic supply disruptions, which have resulted in unplanned outages of up to 500,000 barrels per day (b/d). Nigeria's oil and natural gas industry is primarily located in the southern Niger Delta area, where it has been a source of conflict. Local groups seeking a share of the wealth often attack the oil infrastructure, forcing companies to declare force majeure on oil shipments (a legal clause that allows a party to not satisfy contractual agreements because of circumstances beyond their control). At the same time, oil theft leads to pipeline damage that is often severe, causing loss of production, pollution, and forcing companies to shut in production. Aging infrastructure and poor maintenance have also resulted in oil spills. Natural gas flaring (the burning of associated natural gas that is produced with oil) has contributed to environmental pollution. Protests from local groups over environmental damages from oil spills and natural gas flaring have exacerbated tensions between some local communities and international oil companies (IOCs). The industry has been blamed for pollution that has damaged air, soil, and water, leading to losses in arable land and decreases in fish stocks. The Petroleum Industry Bill (PIB), which was initially proposed in 2008, is expected to change the organizational structure and fiscal terms governing the oil and natural gas industry if it becomes law. International oil companies are concerned that proposed changes to fiscal terms may make some projects commercially unviable, particularly deepwater projects that involve greater capital spending. Currently, most of Nigeria's major oil and natural gas projects are funded through joint ventures (JV) between IOCs and NNPC, where NNPC is the majority shareholder. The rest of the projects are managed through production-sharing contracts (PSCs) with IOCs. PSCs are the fiscal regime typically, but not always, governing deepwater projects and contain more attractive terms than those in JV arrangements, which is the fiscal regime typically governing onshore/shallow water projects. PSC terms on deepwater projects tend to be more favorable to incentivize the development of deepwater projects. NNPC has JV arrangements and/or PSCs with Shell, ExxonMobil, Chevron, Total, and Eni. Other companies active in Nigeria's oil and natural gas industry are Addax Petroleum, Statoil, and several Nigerian companies. IOCs participating in onshore and shallow water oil projects in the Niger Delta region have been affected by the instability in the region. As a result, there has been a general trend for IOCs, particularly Shell, Total, Eni, Chevron, and ConocoPhillips, to sell their interests in marginal onshore and shallow water oil fields, mostly to Nigerian companies and smaller IOCs, and to focus their investments on deepwater projects and onshore natural gas projects. The Petroleum Industry Bill (PIB), which was initially proposed in 2008, is expected to change the organizational structure and fiscal terms governing the oil and natural gas industry if it becomes law. IOCs are concerned that proposed changes to fiscal terms may make some projects commercially unviable, particularly deepwater projects that involve greater capital spending. Some of the most contentious areas of the various PIB drafts include: the potential renegotiation of contracts with IOCs, changes in tax and royalty structures, deregulation of the downstream sector, restructuring of NNPC, a concentration of oversight authority in the Minister of Petroleum Resources, and a mandatory contribution by IOCs of 10% of monthly net profits to the Petroleum Host Communities Fund. Nigeria has the second-largest amount of proved crude oil reserves in Africa, but exploration activity has slowed. Rising security problems, coupled with regulatory uncertainty, have contributed to decreased exploration. According to the Oil & Gas Journal (OGJ), Nigeria had an estimated 37 billion barrels of proved oil reserves by the end of 2015—the second-largest amount in Africa after Libya.13 The majority of reserves are along the country's Niger River Delta and offshore in the Bight of Benin, the Gulf of Guinea, and the Bight of Bonny. Current exploration activities are mostly focused in the deep and ultra-deep offshore, although some onshore exploration is also taking place. NNPC is exploring onshore in northeast Nigeria, within the Chad basin, despite the area's close proximity to the militant group Boko Haram. In late 2015, NNPC announced a potential oil find in the Chad basin, but further studies are underway to assess the area. Nigeria does not currently produce any oil in the north, nor does northern Nigeria have the proper infrastructure to process or transport oil. In addition, instability caused by Boko Haram presents a substantial risk to producing oil in the area. Exploration activities in the onshore Niger Delta in southern Nigeria have decreased because of the rising security problems related to oil theft and pipeline sabotage. Several major IOCs have divested from their onshore assets, which has created opportunity for local Nigerian companies to step in. The regulatory uncertainties surrounding the long-delayed PIB have also contributed to delayed investment in deepwater projects, and the start dates for these projects have continuously been pushed back. Crude oil production in Nigeria peaked at 2.44 million b/d in 2005, but it began to decline significantly as violence from militant groups surged, forcing many companies to withdraw staff and shut-in production. Oil production recovered somewhat after 2009 but still remains lower than its peak level because of ongoing supply disruptions. Nigeria produces mostly light, sweet (low sulfur) crude oil. Most of this oil is exported to global markets. Crude oil production in Nigeria peaked at 2.44 million b/d in 2005, but it began to decline significantly soon after as violence from militant groups surged, forcing many companies to withdraw staff and shut-in production. The lack of transparency on oil revenues, tensions over revenue distribution, environmental damages from oil spills, and local ethnic and religious tensions created a fragile situation in the oil-rich Niger Delta. 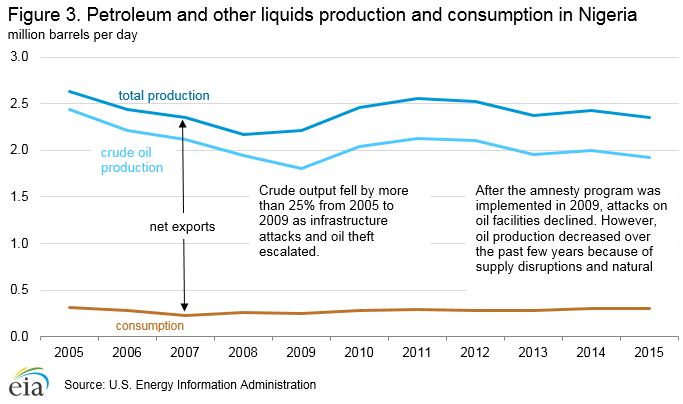 By 2009, crude oil production plummeted by more than 25% to average 1.8 million b/d (Figure 3). In late 2009, amnesty was declared, and the militants came to an agreement with the Nigerian government whereby they handed over weapons in exchange for cash payments and training opportunities. The rise in oil production after 2009 was partly because of fewer attacks on oil facilities following the implementation of the Niger Delta Amnesty Program, allowing companies to repair some damaged infrastructure and bring supplies back online. Another major factor that contributed to the upward trend in oil output was production growth from new deepwater oil fields. The government took measures to attract investment in deepwater acreage in the 1990s to boost production capacity and to diversify the location of the country's oil fields. To encourage investments in deepwater areas, which involve higher capital and operating costs, the government offered PSCs in which IOCs received a greater share of revenue as the water depth increased. In 2015, Nigeria produced 2.3 million b/d of petroleum and other liquids, of which 1.9 million b/d was crude oil and the remainder was condensate, natural gas plant liquids, and refinery processing gains. Nigeria's 2015 production was slightly lower than the previous year because of natural field decline. The 125,000-b/d Usan deepwater field was the last major oil field to start production in Nigeria, which was in February 2012. Since then, there have been smaller start-ups that are extensions of Nigeria's Bonga and Erha deepwater fields. The 40,000-b/d Bonga North West field came online in August 2014, and the Bonga Phase 3 project started production in September 2015, which will eventually add 50,000 b/d.14 The Erha North Phase 2 project came online in October 2015 and will eventually add 65,000 b/d.15 The projects have helped to partially offset production declines. Several planned deepwater projects in Nigeria have been repeatedly pushed back because of regulatory uncertainty. Some draft versions of the PIB have prompted questions about the commercial viability of deepwater projects under the proposed changes to fiscal terms. Deepwater projects have typically included more favorable fiscal terms than onshore/shallow water projects, but the PIB, if passed into law, is expected to increase the government's share of production revenue coming from deepwater projects. As a result of the uncertainty, IOCs have sanctioned (reached a final investment decision) on only one of eight planned deepwater oil projects (Table 1).16 Both sanctioned and unsanctioned deepwater oil projects have the potential to bring online almost 1.1 million b/d of new production over the next five or more years, however, only 200,000 b/d has reached the critical development milestone. If global crude oil prices remain low, this will also exacerbate project delays in Nigeria. Instability in the Niger Delta has resulted in significant amounts of shut-in production at onshore and shallow offshore fields, forcing companies to frequently declare force majeure on oil shipments. Since the mid-2000s, Nigeria has experienced increased pipeline vandalism, kidnappings, and militant takeovers of oil facilities in the Niger Delta. In the past, the Movement for the Emancipation of the Niger Delta (MEND) was one of the main groups attacking or threatening attacks on oil infrastructure for political objectives, claiming to seek a redistribution of oil wealth and greater local control of the oil sector. Security concerns have led some oil services firms to pull out of the country and oil workers' unions to threaten strikes over security issues. The instability in the Niger Delta has also resulted in significant amounts of shut-in production at onshore and shallow offshore fields, forcing companies to frequently declare force majeure on oil shipments. The amnesty program implemented in 2009 led to fewer attacks and supply disruptions in 2009-10, and companies repaired some of the damaged infrastructure. However, the lack of progress in job creation and economic development has contributed to increased crude oil theft and other attacks in recent years. Some stolen crude oil is taken to illegal refineries along the Niger Delta's swampy bush areas and the refined products are then sold domestically and regionally. However, the bulk of the crude oil makes its way to international markets. Most of that oil is sold to world markets directly from Nigeria's export terminals, which is known as white collar theft. White collar theft entails filling tankers (or topping them off) with stolen oil at export terminals or stealing crude from storage tanks and loading it onto trucks. A portion of the global illegally traded oil also involves the transfer of crude oil from small tankers to larger tankers waiting further offshore, also known as ship-to-ship transfers. Estimates of stolen crude oil vary and are as high as 400,000 b/d, but some believe that estimate is too high and may include the volume lost in oil spills. The volume of crude oil that is stolen is difficult to measure because metering systems are usually at export terminals and, therefore, oil stolen between the wellhead and pipelines is not easily detected.19 Furthermore, IOCs do not collectively report volumes stolen, so there is no authoritative source for total stolen volumes. Poorly maintained, aging pipelines and pipeline sabotage from oil theft have caused oil spills. The oil spills have resulted in land, air, and water pollution, severely affecting surrounding villages by decreasing fish stocks and contaminating water supplies and arable land. The Niger Delta region suffers from environmental damage caused by pipeline sabotage from oil theft and also spills from illegal refineries. Poorly maintained, aging pipelines have contributed to oil spills as old pipelines can rupture when they corrode. The amounts spilled because of oil theft versus aging infrastructure and/or operational failures are strongly debated among oil companies and environmental and human rights groups. Oil production and supply disruption estimates for Nigeria vary among Nigerian government officials, global consulting firms, and other international organizations. The main reasons underlying the different production estimates are the classification of crude oil versus condensate and the type of liquids that are included in the total oil supply estimate. The disruption estimates vary because of the methods and definitions used to measure outages. EIA's petroleum and other liquids supply estimates for Nigeria include crude oil, condensate, natural gas plant liquids (ethane, propane, butane, and natural gasoline), and refinery processing gain. Nigeria's oil production is typically reported differently among groups and depends on what liquid streams are included in the numbers. Furthermore, Nigeria's crude oil production may be reported differently among groups because of the classification of crude versus condensate. A significant portion of Nigeria's oil production may be considered either crude or condensate (the latter has a higher API gravity) depending on the qualification on the API scale. The qualification used to classify crude and condensate can differ among groups. EIA estimates that unplanned supply outages to Nigeria's oil production typically range from 200,000 to 300,000 b/d, although they have reached up to 500,000 b/d in the past. The methodology used to measure disruptions can be different across sources and largely depends on production capacity estimates. EIA uses the concept of effective production capacity (which takes into account the amount of production that could come back to markets within a year) to measure Nigeria's unplanned outages. Effective capacity takes into account permanent and/or prolonged production loss as a result of the degradation of shut-in oil fields and damages to operational components that would take longer than a year to repair, which is dependent on financial, security, and political situations. Europe is the largest regional importer of Nigerian crude oil. In 2015, Europe imported slightly more than 800,000 b/d of crude oil and condensate from Nigeria, accounting for 41% of Nigerian exports. The United States typically imported between 9% and 11% of its crude oil from Nigeria before 2012. However, this share has fallen, and in 2014, U.S. imports of Nigerian crude oil accounted for less than 1% of total U.S. crude oil imports. 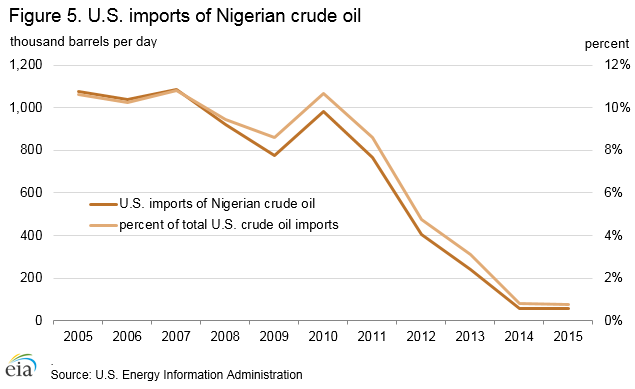 Nigeria has been an important oil supplier to the United States, but the absolute volume and the share of U.S. imports from Nigeria have fallen substantially in recent years. The United States imported an average of 57,000 b/d of crude oil from Nigeria in 2015, a more than 90% drop from the average volume imported in 2010 (Figure 5). As a result, Nigeria fell from being the 5th-largest foreign oil supplier to the United States in 2011 (accounting for 9% of U.S. crude imports) to the 11th in 2015 (accounting for less than 1% of U.S. crude imports). The growth in U.S. light, sweet crude oil production from the Bakken and Eagle Ford has resulted in a sizable decline in U.S. imports of crude grades of similar quality, such as Nigeria's crude oil. As U.S. imports of Nigerian oil decreased over the past few years, European and Asian imports from Nigeria increased. 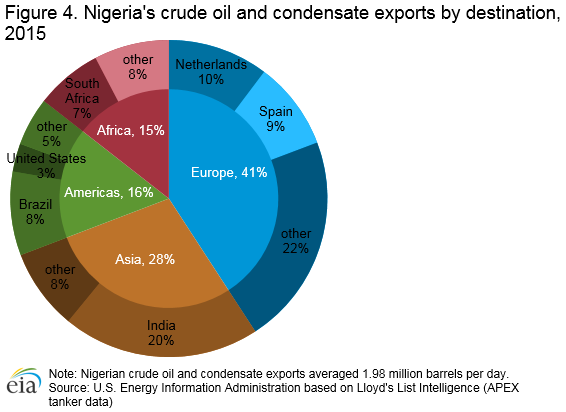 European imports of Nigerian crude and condensate increased year-over-year by more than 40% in 2011 and by 30% in 2012, making Europe the largest regional importer of Nigerian oil. The European embargo on Iranian crude imports and sporadic supply disruptions in Libya contributed to Europe's increased oil imports from Nigeria. In 2015, European imports of Nigerian crude decreased by 100,000 b/d, reflecting a decrease in Nigerian crude production along with more European imports from other countries such as Iraq (Figure 6). Nigeria has a crude oil distillation capacity of 445,000 b/d. Despite having a refinery nameplate capacity that exceeds domestic demand, the country must import petroleum because refinery utilization rates are very low. For several years, the Nigerian government has planned the construction of new refineries, but the lack of financing and government policies on fuel subsidies have caused delays. A Nigerian company, the Dangote Group, plans to construct a 500,000 b/d refinery near Lagos, Nigeria's most populous city. The cost estimates for the refinery have ranged from $9 billion to $14 billion. Plans for the refinery complex include petrochemical and fertilizer plants. The Dangote Group expects the refinery to come online by late 2017, although if the company pursues the project, it will most likely start at a later date.29 If the refinery is built, it will be the largest in Africa. The drop in global crude oil prices in recent years has allowed Nigeria to slowly phase out its fuel subsidy program. In late 2015, NNPC's managing director, Kachikwu, announced that the fuel subsidy would be removed. The fall in export oil revenue because of the drop in oil prices stymied the Nigerian government's ability to fund the program. It is not clear if the subsidy will be partially reinstated when oil prices recover in the future. Nigeria's fuel subsidy program has been surrounded by controversy and allegations of corruption while costing the government billions of dollars. According to an article from Brookings, Nigeria's fuel subsidies cost $8 billion in 2011, accounting for 30% of the government's expenditure, about 4% of GDP, and 118% of the capital budget.32 Nigeria began reforming its fuel subsidy program in early 2012. On January 1, 2012, the Nigerian government removed the fuel subsidy on the grounds that it caused market distortions, encumbered investment in the downstream sector, supported economic inequalities (as rich fuel-importing companies were the main beneficiaries), and created a nebulous channel for fraud. However, the government quickly reversed course about two weeks later and reinstated a partial subsidy as public outcry and massive strikes organized by oil and non-oil unions threatened to shut down oil production. Many Nigerians consider the fuel subsidy a key benefit of living in the oil-rich country. Controversy over Nigeria's fuel subsidy program resurfaced shortly after the partial removal, and there have been government-led investigations into corruption and mismanagement. A report by a Presidential Commission put the revenue losses associated with embezzlement and mismanagement of the fuel subsidy program at about $1.1 billion.33 Tensions between Nigerian fuel importers and the government were also high because the government launched an investigation of the industry to mitigate subsidy mismanagement. The investigation led to the arrest of several marketers and the suspension of companies that were accused of siphoning funds and inflating prices. 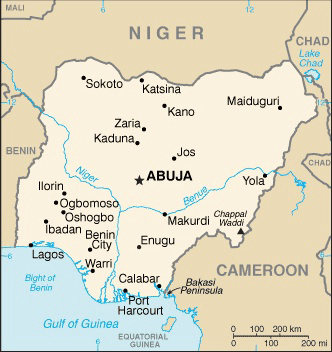 Nigeria is the largest holder of proved natural gas reserves in Africa and the ninth-largest holder in the world. 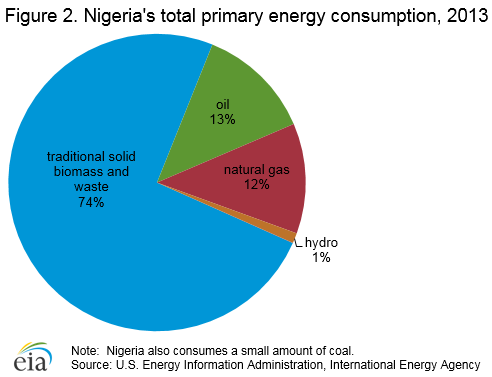 Nigeria produced 1.55 Tcf of dry natural gas in 2014, 14% higher than in 2013. Natural gas production is constrained by the lack of infrastructure to monetize natural gas that is currently being flared. Nigeria had an estimated 180 trillion cubic feet (Tcf) of proved natural gas reserves by the end of 2015, according to OGJ, making Nigeria the ninth-largest natural gas reserve holder in the world and the largest in Africa.34 Despite holding a global top-10 position for proved natural gas reserves, Nigeria produced 1.55 Tcf of dry natural gas in 2014, ranking among the world's top 30 largest natural gas producers. Natural gas production is constrained by the lack of infrastructure to monetize natural gas that is currently being flared. Most natural gas reserves are located in the Niger Delta. The natural gas industry is also affected by the same security and regulatory issues that affect the oil industry. Pipeline sabotage and supply disruptions are common in Nigeria's natural gas industry. One of Nigeria's largest disruptions to natural gas supply occurred from late 2008 to 2009 (Figure 7).35 In November 2008, Shell declared a force majeure on natural gas supplies to the Soku gas-gathering and condensate plant. The Soku plant provides a substantial amount of feed gas to Nigeria's only LNG facility. Shell shut down the plant to repair damages to a pipeline connected to the Soku plant that was sabotaged by local groups siphoning condensate. The plant reopened nearly five months later, but it was shut down again for most of 2009 for operational reasons. As a result, the plant's closure led to a reduction in Nigeria's natural gas production, particularly from Shell's fields in the Niger Delta, and a decline in LNG exports in 2009. 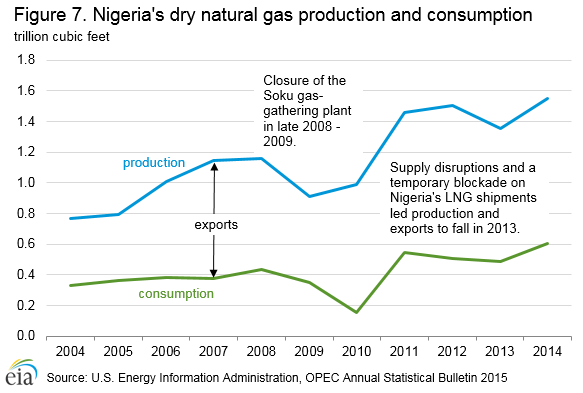 After 2009, Nigeria's natural gas production increased annually until 2013. In 2013, production fell by 10% to 1.35 Tcf because of supply disruptions and a temporary blockade on Nigeria's LNG shipments, which also led to a corresponding fall in exports and, to a lesser extent, domestic consumption because Nigeria does not import natural gas. In 2014, Nigeria's natural gas production grew to its highest level on record of 1.55 Tcf because of fewer supply disruptions. Nigeria consumed 602 billion cubic feet (Bcf) of dry natural gas in 2014, almost 40% of its production. 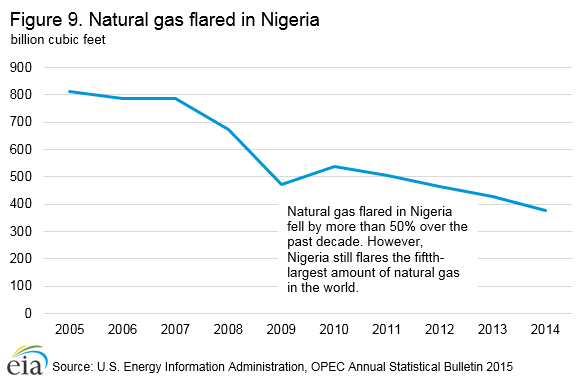 Although Nigeria flares a significant portion of its gross natural gas production (12% in 2014), the amount of gas flared has reduced by more than 50% over the past decade. 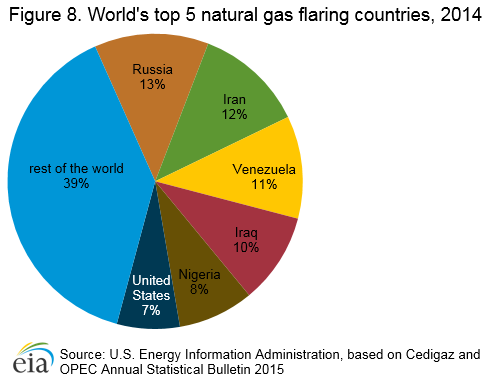 Nigeria now ranks as the fifth-largest natural gas flaring country, down from the second position it held in 2011. A number of recently developed and upcoming natural gas projects that are focused on monetizing previously flared natural gas. The amount of natural gas flared in Nigeria has decreased in recent years, from 540 Bcf in 2010 to 379 Bcf in 2014 (Figure 9).38 According to Shell, one of the largest gas producers in the country, the impediments to decreasing gas flaring have been the security situation in Niger Delta and the lack of partner funding that has slowed progress on projects to capture associated gas. The company recently reported that it was able to reduce the amount of flared gas in 2012 because of improved security in some Niger Delta areas and stable co-funding from partners, which allowed Shell to install new gas-gathering facilities and to repair existing facilities damaged during the militant crisis of 2006 to 2009. Shell also plans to develop the Forcado Yokri Integrated Project and the Southern Swamp Associated Gas Gathering Project to reduce gas flaring (Table 2).39 Sporadic natural gas and oil supply disruptions in the onshore Niger Delta region have increased recently, highlighting the ongoing security and financial risks of operating in the volatile area. The Nigerian government has been working to end natural gas flaring for several years, but the deadline to implement the policies and fine oil companies has been repeatedly postponed, with the most recent deadline being December 2012. In 2008, the Nigerian government developed a Gas Master Plan to promote investment in pipeline infrastructure and new gas-fired power plants to help reduce gas flaring and provide more gas to fuel much-needed electricity generation. However, progress is still limited because security risks in the Niger Delta have made it difficult for IOCs to construct infrastructure that would support gas commercialization. 1MMcf/d is million cubic feet per day. 2Units are in barrels of oil equivalent per day (boe/d) for the Forcados and Southern Swamp projects. Nigeria exported about 900 Bcf of LNG in 2014, accounting for 8% of LNG traded globally and ranking Nigeria as the world's fourth-largest LNG exporter. Japan is the largest importer of Nigerian LNG and received 26% of the total in 2014. Nigeria exports the vast majority of its natural gas in the form of LNG, and a small amount is exported via the West African Gas Pipeline (WAGP) to nearby countries. The pipeline was shut down from August 2012 to July 2013 for repairs after a ship's anchor severed the pipeline in the Togolese waters. As a result, natural gas exports via WAGP fell from 29 Bcf in 2011 to 14 Bcf in 2012, but volumes have since partially recovered to 21 Bcf in 2013 and 2014, according to Cedigaz data.41 The WAGP operates at about one-third of its capacity. The United States no longer imports natural gas from Nigeria. U.S. imports from Nigeria peaked at 57 Bcf in 2006 and fell to 2 Bcf in 2011, mostly as a result of growing U.S. natural gas production. In 2012, the United States did not import LNG from Nigeria for the first time since 1999. 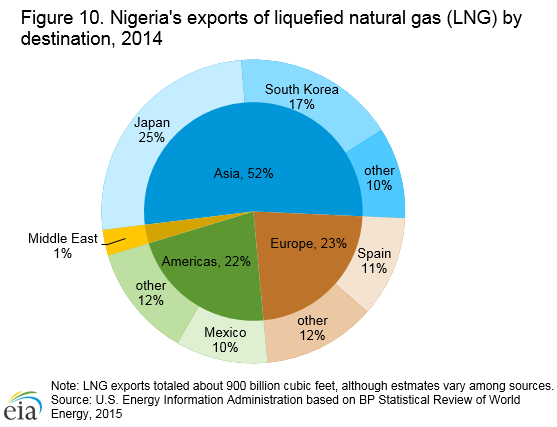 In 2013, the United States resumed imports from Nigeria, receiving 2.5 Bcf of LNG. However, the United States did not import any gas from Nigeria in 2014 and 2015. 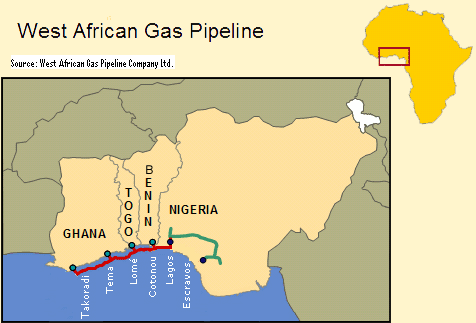 Nigeria and Algeria have proposed plans to construct the Trans-Saharan Gas Pipeline (TSGP). The 2,500-mile pipeline would carry natural gas from oil fields in Nigeria's Delta region to Algeria's Beni Saf export terminal on the Mediterranean Sea and eventually supply natural gas to Europe. In 2009, NNPC signed a memorandum of understanding (MOU) with Sonatrach, the Algerian national oil company, to proceed with plans to develop the pipeline. Some national and international companies have shown interest in the project in the past, including Total and Gazprom. But security concerns along the entire pipeline route, increasing costs, and ongoing regulatory and political uncertainty in Nigeria have continued to delay this project. Nigeria has one of the lowest rates of net electricity generation per capita in the world. Electricity generation falls short of demand, resulting in load shedding, blackouts, and a reliance on private generators. Nigeria has one of the lowest rates of net electricity generation per capita in the world. Those with access to electricity face load shedding, blackouts, and a reliance on private generators. According to a 2010 Harvard paper, more than 30% of electricity is produced by inefficient private generators.55 Businesses often purchase costly generators to use as back-up power supply during outages. Most Nigerians use off-grid traditional biomass and waste, such as wood, charcoal, and animal dung, to fulfill household energy needs, such as cooking and heating. On November 1, 2013, Nigeria's federal government officially sold almost all of its successor electricity generation companies (GenCos) and distribution companies (DisCos) to private owners. The privatization was part of a power sector reform initiated by the 2005 Electric Power Sector Reform Act. The act required the unbundling of the state-owned Power Holding Company of Nigeria (PHCN), which oversaw the GenCos and DisCos. The private companies that purchased the GenCos and DisCos took physical ownership of the generation and distribution infrastructure and the responsibility of improving/repairing the system. Five of six GenCos and ten of eleven DisCos sold, while the remaining two successor companies will go under Nigeria's state-owned Transmission Company, which will remain under the federal government's control. The Nigerian federal government is in the process of selling 10 natural gas-fired power plants that are a part of the National Integrated Power Projects (NIPP). NIPP was established in 2004 by the Nigerian government as a plan to construct multiple natural gas-fired power plants using natural gas that was flared. However, there is a shortage of natural gas supply for power generation in Nigeria because it competes with exports, and it is more profitable for producers to export the gas rather than selling it to the domestic market for a lower price. This situation has affected the state's ability to sell the NIPP plants. Data presented in the text are the most recent available as of May 6, 2016. Data are EIA estimates unless otherwise noted. 1BP, Statistical Review of World Energy, Excel workbook of historical data, 2015. 2Secretariat of the Organization of the Petroleum Exporting Countries, Nigeria facts and figures, accessed January 2015. 3International Monetary Fund, Nigeria, IMF Country Report No. 15/84, (March 2015), pages 28-30. 5International Monetary Fund, Nigeria, IMF Country Report No. 15/84, (March 2015), page 85. 6EIA and International Energy Agency statistical databases. 7International Energy Agency (IEA), World Energy Outlook 2014, Electricity Database (2012 estimates). 8International Energy Agency (IEA), World Energy Outlook 2014, Biomass Database (2012 estimates). 9Nigerian National Petroleum Corporation Group, About NNPC, accessed January 2015. 10The Petroleum Regulatory Agency of Nigeria, About Us, accessed January 2015. 11Newsbase, "Buhari takes steps on reforming NNPC," Africa Oil & Gas Monitor, (January 12, 2016), week 01, issue 621, page 11. 12Newsbase, "Nigeria plans to breaks up NNPC," Africa Oil & Gas Monitor, (March 8, 2016), week 09, issue 629, page 11. 13Oil & Gas Journal, Worldwide Look at Reserves and Production, (January 1, 2015). 14Oil & Gas Journal, "Shell starts oil production from Bonga North West off Nigeria," (August 6, 2014); Shell Global "Shell Commences Production from Bonga Phase 3 project in Nigeria," (October 5, 2015). 15ExxonMobil, "ExxonMobil starts oil production at Erha North Phase 2 Project ahead of schedule and well under budget," (September 16, 2015). 16Chevron Corporation, Nigeria Fact Sheet, (May 2015); ExxonMobil, Financial & Operating Review 2014, pages 24-36; Royal Dutch Shell, Investors' Handbook, (2014); Total, The Egina: A flagship project for Total and Nigeria, accessed March 2016. 17IHS Energy, Strategic Horizons, "Nigeria: Heightened sabotage risk to test oil security and reform," (March 31, 2016). 18Chatham House, "Nigeria's Criminal Crude: International Options to Combat the Export of Stolen Oil," Chapter 1 and 3, (September 2013). 20United Nations Environment Program (UNEP), "Environmental Assessment of Ogoniland," (2011). 21Reuters, "Oil tankers run gauntlet in Nigeria's pirate alley," (February 5, 2015). 22Global Risk Insights, "Piracy in West Africa targets the region's oil industry," (December 27, 2014). 23Reuters, "Oil tankers run gauntlet in Nigeria's pirate alley," (February 5, 2015). 24United Nation's Operational Satellite Applications Program,UNOSAT Global Report on Maritime Piracy, (2014). 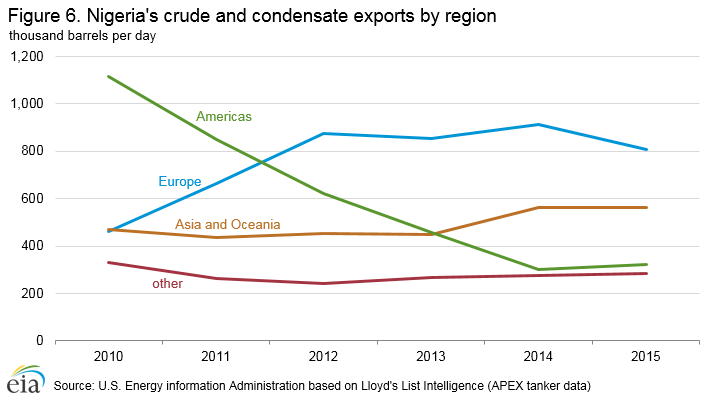 25EIA and Lloyd's List Intelligence, APEX tanker data, accessed March 2016. 26Oil & Gas Journal, Worldwide Refining, (January 2015). 27Nigerian National Petroleum Corporation, Annual Statistics Bulletin, (2014), page 5. 28Secretariat of the Organization of the Petroleum Exporting Countries, OPEC Annual Statistical Bulletin 2015, page 61. 29Bloomberg Business, "Dangote Says Nigeria Lagos Refinery to start by mid- 2018," (November 17, 2014); Reuters, "Update 1-Nigeria's Dangote group expects $9bln refinery to start by 2017," (March 17, 2015). 30Platts, "Nigerian government did not approve oil refineries privatization plan: report," (January 3, 2014). 31Financial Times, "Q&A: Nigeria's fuel shortage crisis," (May 28, 2015). 32Brookings, "Removal of Fuel Subsidies in Nigeria: An Economic Necessity and a Political Dilemma," (January 10, 2012). 33Bloomberg Business, "Oil's Slump Gives Nigeria Chance to End $7-Billion Subsidy," (December 23, 2014). 34Oil & Gas Journal, Worldwide Look at Reserves and Production, (January 1, 2015). 35Secretariat of the Organization of the Petroleum Exporting Countries, OPEC Annual Statistical Bulletin 2015, pages 97. 36Secretariat of the Organization of the Petroleum Exporting Countries, OPEC Annual Statistical Bulletin 2015; Cedigaz, Statistical Database, (September 2015). 38Secretariat of the Organization of the Petroleum Exporting Countries, OPEC Annual Statistical Bulletin 2015, page 97. 39Chevron Corporation, Nigeria Fact Sheet, (May 2015); ExxonMobil, Financial & Operating Review 2014, pages 24-36; Royal Dutch Shell, Investors' Handbook, (2014). 40Chevron, Nigeria Business Portfolio, Exploration and Production, (May 2015). 41Cedigaz, Statistical Database, (September 2015). 42BP, Statistical Review of World Energy, Excel workbook of historical data, 2015. 43Secretariat of the Organization of the Petroleum Exporting Countries, OPEC Annual Statistical Bulletin 2015, page 97. 44BP, Statistical Review of World Energy, Excel workbook of historical data, 2015. 46Nigeria LNG Limited (NLNG), Shareholders, accessed February 2015. 47Nigeria LNG Limited (NLNG), Our LNG: commercial capacity, accessed February 2015. 48LNG World News, "ConocoPhillips exits Brass LNG project," (July 30, 2014). 49Total, The Brass LNG Project (Nigeria), accessed February 2015. 50West Africa Gas Pipeline Company limited (WAPCo), Company Profile, accessed February 2015. 51West African Gas Pipeline Company limited (WAPCo), West African Gas Pipeline (WAGP). 52West Africa Gas Pipeline Company limited (WAPCo), The Pipeline System, accessed February 2015. 53Cedigaz, Statistical Database, (September 2015). 54International Energy Agency (IEA), World Energy Outlook 2014, Electricity Database (2012 estimates); African Development Fund, "Project Appraisal Report: Partial Risk Guarantee in Support of the Power Sector Privatizations," (December 2013), pages 1-8. 55Harvard, Program on the Global Demography of Aging, "Nigeria: The Next Generation Report," (October 2010), PGDA Working Paper No. 62, page 47. 56Nigeria's Presidential Task Force on Power, Roadmap for Power Sector Reform, (August 2013), page 24. 57HydroWorld.com, "Nigeria's US$1.3 billion 700-MW Zungeru hydroelectric project deals with challenges," (December 12, 2014).